Roberto Assagioli (February 27, 1888 - August 23, 1974) was an influential Italian psychiatrist, the founder of the psychological movement known as Psychosynthesis. He was the first psychiatrist to integrate elements of what are often considered religious and spiritual concepts into modern psychology. Assagioli was a bold innovator, whose ideas were far ahead of his time. However, he did live to see his ideas take form in the work of many students, publications, and the development of centers that used and developed his theory. His goal was not just to treat psychopathology, using a more complete method that the Freudian psychoanalysis with which he started. He also wanted to develop a way to guide each person to understand the meaning of human life in all its contexts. Although he included the spiritual element of human nature in his conceptions, he maintained a separation between his psychological work and the doctrines and practices of religion. Since ultimately both psychology and religion seek to understand human nature and support the growth of each person to fulfill their God-given potential, in the end it may be necessary to bring these two fields into a synthesis. However, given the divisions within them in Assagioli's day, he was wise to maintain separation. Roberto Assagioli was born on February 27, 1888 in Venice, Italy, of a Jewish mother. He was imprisoned by Benito Mussolini, but was later freed through the intervention of powerful friends. His solitary confinement in prison led Assagioli to self-examination. When he was released, he wrote, "My dedication is to the task of helping men and women free themselves from inner prisons." Assagioli was one of three Italians credited with being pioneers of the psychoanalytic movement. As a medical student, he introduced Freud's concept of psychoanalysis to his professors in Florence. While embracing the radical new currents of psychoanalysis, he simultaneously—in 1910—began a critique of that same psychoanalysis. He saw that it was only partial in that it neglected the exploration of what Abraham Maslow, some 60 years later, would call "the farther reaches of human nature." Thus he began the groundwork for Psychosynthesis. He saw that there was a need for something beyond analysis. This was the need for a person to become whole, to be united in synthesis. Assagioli's purpose was to create a scientific approach which encompassed the whole human being—creativity and will, joy and wisdom, as well as impulses and drives. He wanted this integrative approach to be practical, not only an understanding of how we live, but a tool to help us live better, more fully, according to the best that is within each of us. His colleagues included Abraham Maslow, Carl Jung, and Rabindranath Tagore. In 1909, C.G. Jung wrote to Sigmund Freud of “a very pleasant and perhaps valuable acquaintance, our first Italian, a Dr. Assagioli from the psychiatric clinic in Florence.”  Later however, Assagioli wrote a doctoral dissertation, “La Psicosintesi,” in which he began to move away from Freud’s psychoanalysis towards what he called psychosynthesis. Assagioli was also a coworker of Alice Bailey, who had founded a New Age esoteric school called the Arcane School. In the book Discipleship in the New Age, he is known by the initials F.C.D. standing for "Freedom from Ties, Chelaship, and Detachment." It was his intention that this information would never be made public because of concern that his connection with Alice Bailey would harm the professional standing of Psychosynthesis. Authors John Firman and Ann Gila wrote that Assagioli kept what he referred to as a "wall of silence" between the areas of psychosynthesis and religion or metaphysics, insisting that they not be confused with each other. Only the development of his inner powers can offset the dangers inherent in man's losing control of the tremendous natural forces at his disposal and becoming the victim of his own achievements. Roberto Assagioli died quietly on August 23, 1974 in Capolona d'Arezzo in Italy. Roberto Assagioli's work, Psychosynthesis, is a uniquely synthetic approach to psychology. Although it has points in common with Humanistic psychology, Transpersonal psychology, and Existential psychology, the emphasis in Psychosynthesis is on the possibility of progressive integration of the personality around its own essential Self through the use of the will. To this end, it uses a number of specifically designed psychological training methods and techniques. The use of active techniques to stimulate the psychic functions still weak and immature. In his view of the human psyche, Assagioli maintained that just as there was a lower unconscious, there was also a "superconscious." He describes this as a realm of the psyche which contains our deepest potential, the source of the unfolding pattern of our unique human path of development. Assagioli distinguished psychosynthesis from psychoanalysis, but his intention was not to replace psychoanalysis, but rather to complement and include it. Psychosynthesis then is not simply a model of pathology and treatment, but a developmental approach which can help guide a person to understand the meaning of their human life within the broad context of synthesis—the drive towards the harmonization of all relationships, whether intrapersonal, or interpersonal, between individuals and groups. 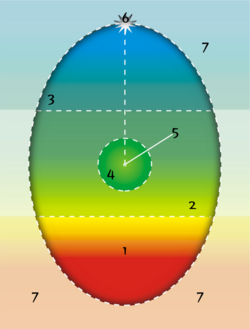 In essence, psychosynthesis can be best represented by the "egg diagram." The Conscious Self or "I"
The lower unconscious is that realm of the person to which is relegated the experiences the shame, fear, pain, despair, and rage caused by primal wounding suffered in life. One way to think of the lower unconscious is that it is a particular bandwidth of one’s experiential range that has been broken away from consciousness. It comprises that range of experience related to the threat of personal annihilation, of destruction of self, of nonbeing, and more generally, of the painful side of the human condition. As long as this range of experience remains unconscious, the person will have a limited ability to be empathic with self or other in the more painful aspects of human life. The middle unconscious is a sector of the person whose contents, although unconscious, nevertheless remain readily available to normal conscious expression (thus it is illustrated as most immediate to “I”). It is the capacity to form patterns of skills, behaviors, feelings, attitudes, and abilities that can function without conscious attention, thereby forming the infrastructure of one’s conscious life. The function of the middle unconscious can be seen in all spheres of human development, from learning to walk and talk, to acquiring a new language, to mastering a trade or profession, to developing social roles. All such elaborate syntheses of thought, feeling, and behavior are built upon learnings and abilities that must eventually operate unconsciously. However, in order to survive primal wounding, from early nonempathic environments, this ability of unconsciousness is used in another, more desperate way: to repress important aspects of experience—both negative and positive—which are not acceptable to those environments. The sector formed by repressing the rich human potentials threatened by wounding—perhaps abilities to love, create, express joy, commune with nature, or sense a unity with the Divine—is called the higher unconscious. Similarly, the sector that hides the pain of the wounding—whether from covert or overt neglect and abuse—is called the lower unconscious. The lower unconscious and higher unconscious are the other two major levels of the unconscious represented in the oval diagram. The higher unconscious (or superconscious) denotes “our higher potentialities which seek to express themselves, but which we often repel and repress.” As with the lower unconscious, this area is by definition not available to consciousness, so its existence is inferred from moments in which contents from that level affect consciousness. Contact with the higher unconscious can be seen in those moments, termed "peak experiences" by Maslow, which are often difficult to put into words, experiences in which one senses deeper meaning in life, a profound serenity and peace, a universality within the particulars of existence, or perhaps a unity between oneself and the cosmos. This level of the unconscious represents an area of the personality that contains the “heights” overarching the “depths” of the lower unconscious. As long as this range of experience remains unconscious, the person will have a limited ability to be empathic with self or other in the more sublime aspects of human life. “I” is the direct "reflection" or "projection" of Self and the essential being of the person, distinct but not separate from all contents of experience. “I” possesses the two functions of consciousness (or awareness) and will (or personal will) whose field of operation is represented by the concentric circle around “I” in the oval diagram. “I” is placed at the center of the field of awareness and will in order to indicate that “I” is the one who has consciousness and will. It is “I” who is aware of the psyche-soma contents as they pass in and out of awareness; the contents come and go, while “I” may remain present to each experience as it arises. But “I” is dynamic as well as receptive: “I” has the ability to affect the contents of awareness and can even affect awareness itself, by choosing to focus awareness (as in many types of meditation), expand it, or contract it. Pervading all the areas mapped by the oval diagram, distinct but not separate from all of them, is Self (which has also been called Higher Self or Transpersonal Self). The concept of Self points towards a source of wisdom and guidance within the person, a source which can operate quite beyond the control of the conscious personality. Since Self pervades all levels, an ongoing lived relationship with Self—Self-realization—may lead anywhere on the diagram as one's direction unfolds (this is one reason for not illustrating Self at the top of the diagram, implying that is the direction of Self-realization). Relating to Self may lead for example to engagement with addictions and compulsions, to the heights of creative and religious experience, to the mysteries of unitive experience, to issues of meaning and mortality, to grappling with early childhood wounding, to discerning a sense of purpose and meaning in life. Assagioli did not limit this relationship and dialog to those dramatic experiences of “call” seen in the lives of great men and women throughout history. Rather, the potential for a conscious relationship with Self exists for every person at all times and may be assumed to be implicit in every moment of every day and in every phase of life even when one does not recognize this. Within one’s private inner world of feelings, thoughts, and dreams, or within one’s relationships with other people and the natural world, a meaningful ongoing relationship with Self may be lived. Assagioli understood the oval to be surrounded by the collective unconscious postulated by Jung. This comprises inherited propensities or capacities for particular forms of experience and action shared by the species as a whole and developed over the course of evolution. "Assagioli had the vision and the courage to put forward in psychiatry an approach that did justice to all the dimensions of man—physical, emotional, mental and spiritual, even though the view ran counter to the prevailing mechanistic conceptions of the time." Assagioli was a bold innovator who lived to see his ideas take form in hundreds of articles, books in many languages, students in numerous countries, a body of theory pregnant with new implications and consequences, and centers continuing to develop his work in the United States, Canada, England, Italy, Switzerland, France, Greece, and Argentina. His ideas were far ahead of his time. He developed his work in 1910 and it was only in the late sixties that, with the suddenness born of deep and massive need, his books and other writings were taken up by thousands. His face was shining with an extraordinary, radiant, inner glow, such as I have never encountered in an octogenarian, and rarely in men much younger. This message of joy, perceived immediately, communicated immediately, is the finest memory which I keep of the numerous meetings which we later had with him. He elicited the joy of Self-realization in those who came to see him. He found joy in the contemplation of beauty, of art, of ideas, of service; of science, of nature. It was the joy of this knowing that must have made the years of his waiting easy. This was a far-seeing joy, one that grew on his love of contemplating from his garden the vast and starry reaches of the Italian sky - the endless worlds, the living cosmic miracle of what is and what is becoming. Assagioli, Roberto. 1993. Psychosynthesis. New York, NY: Penguin/Arkana. ISBN 9780140194609. Assagioli, Roberto. 1993. The Act of Will. ISBN 978-0140194630. Assagioli, Roberto. 1993. Transpersonal development the dimension beyond psychosynthesis. London: Aquarian/Thorsons. ISBN 9781855382916. ↑ Al Mankoff, Roberto Assagioli, Psychosynthesis, and the Esoteric Roots of Transpersonal Psychology Retrieved November 2, 2007. ↑ Roberto Assagioli, Psychosomatic Medicine and Bio-psychosynthesis (1967). Retrieved December 3, 2007. ↑ In Memoriam: Roberto Assagioli Synthesis Journal www.aap-psychosynthesis.org. Retrieved November 4, 2007. Crampton, Martha. 1977. Psychosynthesis: Some Key Aspects of Theory and Practicewww.dynthesiscenter.org. Retrieved December 3, 2007. McGuire, William (ed.) The Freud/Jung Letters Vol. XCIV, Bollingen Series. Princeton, NJ: Princeton University Press, 1974. Parfitt, Will. 1990. The elements of psychosynthesis. Dorset: Element Books. ISBN 9781852301569. Istituto di Psicosintesi The Institute of Psychosynthesis founded by Roberto Assagioli. Psychosynthesis Online Quotes on Psychosynthesis as well as a Psychosynthesis & Transpersonal Web Directory. Psychosynthesis Personality Assessment: Understanding ourselves and our relationships. Psychosynthesis Basic concepts, links, articles including some by Roberto Assagioli. Southern Psychosynthesis Community Network has articles in plain language on Psychosynthesis. The Institute of Psychosynthesis, London - Counselling and Psychotherapy Training and Self-Development. The Will Project was a project proposed by Roberto Assagioli to explore all aspects and manifestations of the Will. This page was last modified on 15 July 2015, at 16:21.